Vacant Lot in Jasper Town to build on! Quaint 3BR/1BA home in the HEART of JASPER! 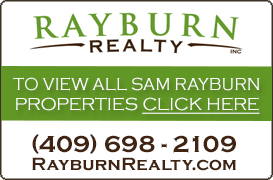 PENDING***3BR/3BA Home w/POOL overlooking Driving Range in Rayburn Country***BEAUTIFUL VIEWS! This older home screams FARMHOUSE! 4BR/3.5BA on 2+- acres in Jasper Co. close to the river. 52+ ACRES w/BRICK HOME (4BR/2.5BA), pool, pond and beautiful acreage-Pineland, Tx. PENDING***This Property has the possiblity of two families enjoying the lake. PRIME COMMERICAL LOCATION for EVERYTHING that happens in RAYBURN COUNTRY! This lot is located in the golf course area. The lot next to it is also FOR SALE and it is on the golf course. Buy both lots and have plenty of space to build your new home on the golf course.